Lake Merced, India Basin, McNab Park, Maritime National Historic Park, and more! Harlem River, Jamaica Bay, Van Cortlandt Park, Roberto Clemente State Park, and more! Where Canoemobile began as "Urban Wilderness Canoe Adventures"
Canoemobile is a “floating classroom” that brings students out on local waterways in 24-foot Voyageur canoes to learn about science, history, geography, and culture. Our on-water experiences are often enriched with land-based learning activities developed and facilitated by organizations such as the U.S. Fish and Wildlife Service, the National Park Service, and hundreds of other government and nonprofits. 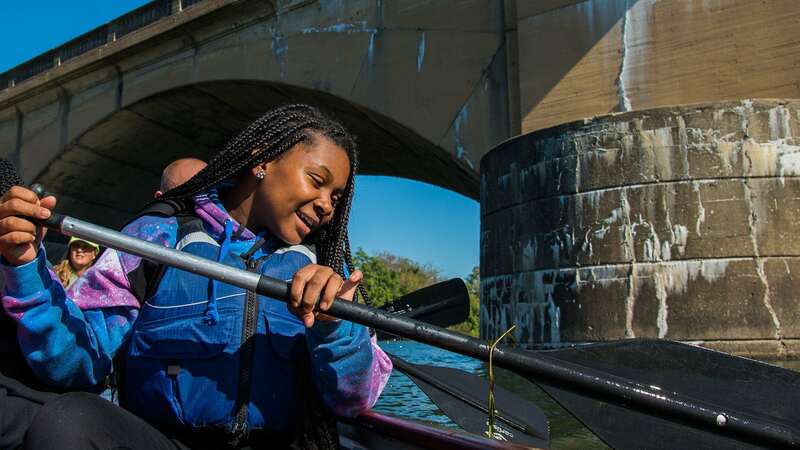 Canoemobile brings classroom learning outside, engaging youth to improve school performance, cultivate a stewardship ethic, and create pathways to pursue educational and career opportunities in the outdoors. Canoemobile travels around the country so that a diverse array of students have the chance to experience the nation’s best outdoor field trip. In addition, Canoemobile offers free and open-to-the-public paddles in communities where it is working. These experiences change waterways into places of recreation, learning, and community-building. From San Francisco to the Bronx, communities welcome Canoemobile to serve more than 30,000 youth and adults of all backgrounds and abilities each year.